However great your website happens to be, it cannot answer every customer question immediately or know what each visitor is struggling to find. So how can you stop people leaving your pages in frustration and disappointment? What can you do to satisfy these potential customers or turn their interest into additional sales? Wouldn’t it be great if your agents could offer personal help to multiple online customers at the same time in a cost-effective way? With the easy-to-use agent console, your team can exchange messages with multiple customers and share URLs to the pages and information they need. 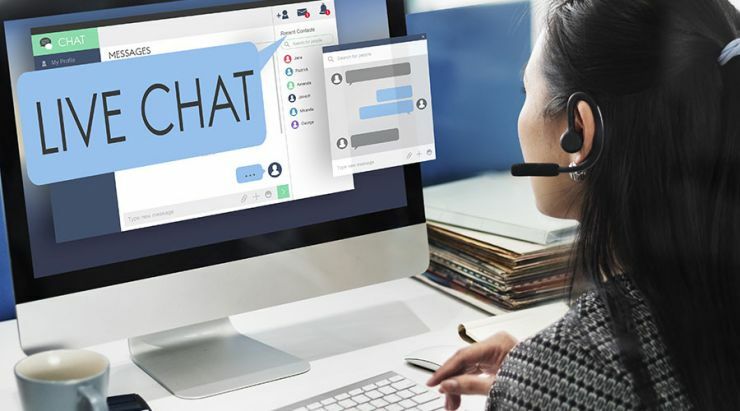 And when chat sessions are over, the conversation can be downloaded instantly to customers as a PDF and a survey offered automatically (with our After Service Surveys). Web Chat is really easy to set up and customise. Within seconds of going live, your agents will be text chatting with customers. The technical magic that lets Web Chat run on your website is easy to add. The Chat button and the customer-facing window can be designed to look like your website's theme. The Library of Responses lets you automate many of your commonly-used greetings and answers, so you save time for your agents and provide a consistent, professional service. Wouldn't it be great if your customers could just place and pay for their order within the chat session, without being told to go and pay elsewhere? Together with Web Chat and our ability to take PCI DSS compliant payments, you can now offer that. Download the datasheet below to find out more. Want to show a customer a specific page while you're chatting? Push them the URL. You can also look at the screen with them using Co-browse. With our Social Agent service, every Tweet, Facebook posting or community and forum comment becomes a live chat multi-channel into one channel in real time. Want to know what your customers think of your service levels? Ask them! At the end of each chat session, a quick survey will give you feedback in real time.